I haven’t quite got the hang of taking photos of clear glass. My photos don’t really do justice to these pieces. On the left is a large round jar with ‘United States Nuts Co. embossed on the side. This would have been for dispensing nuts in a General Store back in the day. The two jars with the red plastic handles and metal lids are really quite pretty. 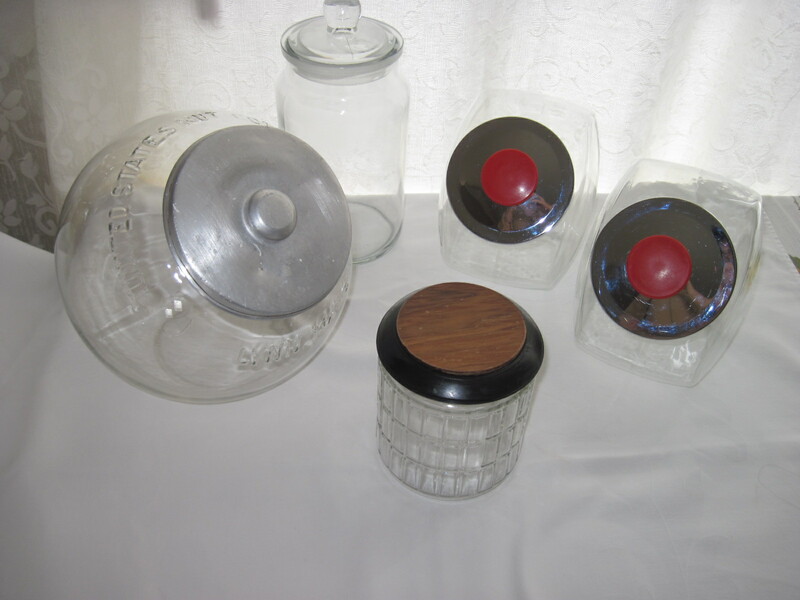 The smaller one in front with the wood and black plastic lid has a waffle pattern and was made by Dominion Glass in Montreal. The one in the back with the clear glass lid is also a Canadian glass manufacturer. These will be for sale at my booth in Almonte ON at the Almonte Antique Market. Note: the US Nuts Co. container is now SOLD! The storage jars with red knob lids are now SOLD! !